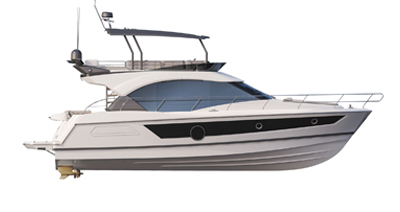 the 2016 version of the Swift Trawler 50 offers a greater amount of interior space and light. for its intelligently-designed fittings and very easy handling. Cleverly-designed and pragmatic, the Swift Trawler 50 maximizes autonomy features to enable long-distance cruising. Available with three large double cabins or two double cabins together with an office with an extra berth, it has a magnificent U-shaped galley and is fitted with a washing machine and tumble drier. The finish and choice of contemporary decoration contrast with the Mahogany woodwork ambiance creating an infinitely more elegant interior. cruising long distances, in safety and comfortably. the Swift Trawler 50 is a boat for ocean adventures. With a joystick for manoeuvring, electric aft capstan winches making mooring easier, on-board control cameras and hydraulic platform to launch the tender, the high level of equipment makes cruising and manoeuvres safe. A very clever dining space beside the helm station can be converted into a watch berth for long-distance cruises. The service hatch between the galley and the flybridge makes life easier on the upper deck. The Swift Trawler 50 is available in two versions: three double cabins or two double cabins with office, extra berth and skipper cabin. Ideally located at the centre of the boat, the ensuite owner’s quarters have separate shower and separate toilet compartments. The guest cabin is spacious and bright. The converting sofa, with separating curtain, turns the saloon into and extra cabin. The whole of the deck is surrounded by high bulwarks. The width of the walkways has been increased. Both the flybridge and wheelhouse enjoy extraordinary visibility. The interior companionway slopes gently, providing access to the cabins. CE certification: B14 / C18. External galley with worktop, sink, dustbin, 42 L fridge (option), electric grill (option). Large flybridge lounge with folding and sliding table. Large area aft of the flybridge. 2 engines 2 x D6 IPS 600 - 2 x 435 HP Diesel. Large swim platform with swim ladder locker. Option: hydraulic platform (max. load 350 kg). life-raft stowage location. Large U-shaped galley with extractor hood, double sink, two refrigerators, and service-hatch. L-shaped saloon bench seat converting into double berth. Second convertible bench seat near the driving station. Driving console can be lifted up to access electronics. Owner's cabin. Bed with slatted bed frame and storage. Office, storage, hanging locker. Guest fore cabin. Depending on layout chosen, third cabin with bunk beds or office with berth. Owner bathroom and adjoining guest bathroom with separate shower compartment. Owner's cabin. Bed with slatted bed frame and storage. Office, storage, hanging locker. Guest fore cabin. Depending on layout chosen, third cabin with bunk beds or office with berth.Sailor cabin with heads at the stern. Owner bathroom and separate toilet. Guest bathroom with separate shower.